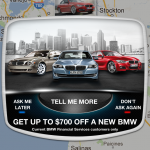 In August of 2011, my team and I at BMW Financial Services launched BMW’s most popular smartphone app, The Ultimate Drive. While our BMW vehicles are the best cars in the world to drive (I’m not biased or anything), our app allows you to discover and share the best roads in the world to drive. You can even rate and rank each road by several dimensions, such as twistiness, fun, traffic and scenery. The Ultimate Drive was the #1 downloaded navigation app on iTunes for nearly 2 weeks, and top 10 for over a month. If you’re a BMW Financial Services customer, you can use your account info to access special features in the app, such as creating mobile vouchers worth up to $700 off the first payment on a new BMW. We originally launched The Ultimate Drive app in August 2011 with the hope that everyone can experience the joy of driving that BMW customers have known for years. The success of that launch was overwhelming and we received many accolades from users all over the country. With this latest version, we at BMW Financial Services want to be the ones saying “thank you” – specifically to our loyal customers. As an industry first, we want to reward the most passionate BMW drivers and fans through the very app that embodies this spirit, on a vehicle that is the very essence of the Ultimate Driving Machine – the 2012 3 Series. The 3 Series has always been “the luxury sports sedan” that consistently sets the benchmark for performance, styling, and design. While the bar is set so high, we believe the 2012 3 Series surpasses the high standards we’ve set for ourselves. It’s only been a day since we announced the promotion, and we’ve already seen excitement building as BMW Financial Services customers all across the country continue to walk away from their BMW 3 Series test drive with a $300 voucher in hand. So please download The Ultimate Drive app, and if you are lucky to be a BMW driver (and BMW Financial Services customer) please take this offer as our sincere “thank you” for being a fan of The Ultimate Driving Machine.